The Certified Ethical Hacker (C|EH v10) program is a trusted and respected ethical hacking training Program that any information security professional will need. This course in its 10th iteration, is updated to provide students with the tools and techniques used by hackers and information security professionals alike to break into any computer system. This course will immerse the students into a “Hacker Mindset” to teach them on how to think like a hacker and better defend against future attacks. It puts the students in the driver’s seat with a hands-on training environment employing a systematic ethical hacking process. Students will constantly exposed to creative techniques of achieving optimal information security posture in the target organization; by hacking it! Students will also learn how to scan, test, hack and secure target systems. The course covers the Five Phases of Ethical Hacking, diving into Reconnaissance, Gaining Access, Enumeration, Maintaining Access, and covering your tracks. When a student leaves this intensive 5 days class they will have hands on understanding and experience in Ethical Hacking. Students are able to discover the key issues plaguing the information security world, incident management process, and penetration testing. Students are able to determine different threats to IoT platforms and learn how to defend IoT devices securely. 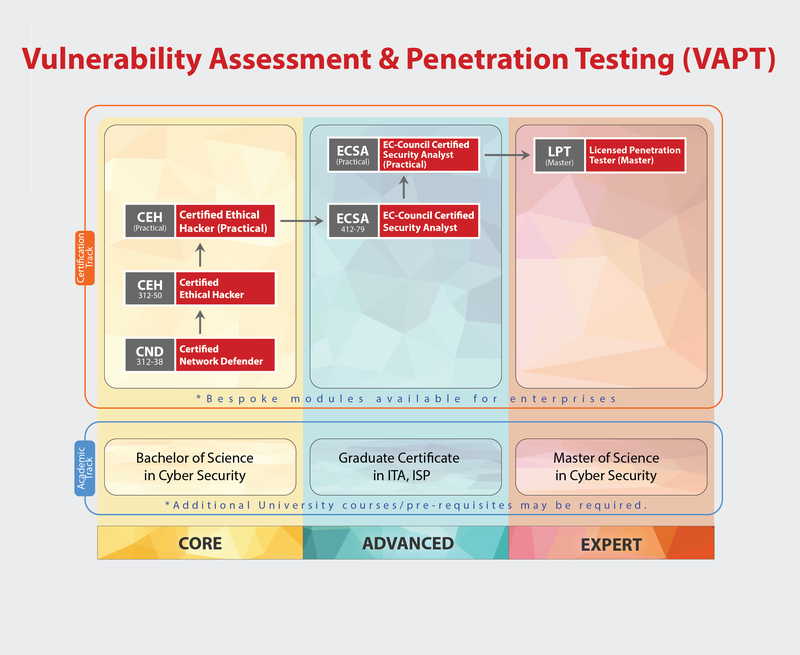 Students are able to perform vulnerability analysis to identify security loopholes in the target organization’s network, communication infrastructure, and end systems. Students are able to understand mobile platform attack vector, android vulnerabilities, mobile security guidelines, and tools. Students are able to implement wireless encryption, wireless hacking methodology, wireless hacking tools, and Wi-Fi security tools. This course will significantly benefit ethical hackers, system administrators, network administrators and engineers, webmanagers, auditors, security professionals in general.